Famous people from the town include Scottish obstetrician Sir James Young Simpson who discovered the anaesthetic properties of chloroform, Ryder Cup golf captain Bernard Gallacher and actor [and the tenth Dr Who] David Tennant. Indy Car racing champion Dario Franchitti and his young car racing brother Marino hail from Bathgate, along with 80s/90s band Goodbye Mr McKenzie, with Shirley Manson on keyboards who went onto have major success as lead singer of Garbage. 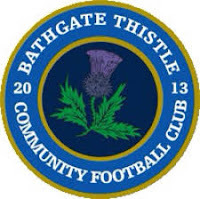 Bathgate Thistle Junior Football Club was formed in 1936, taking over the place of the Bathgate senior side in the Midlothian League for season 1938/39. 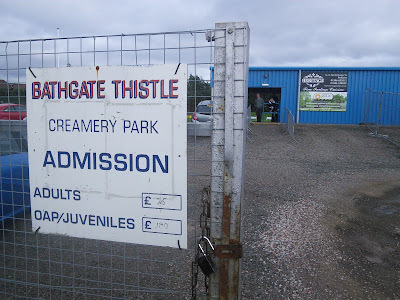 Thistle reached their first Scottish Junior Cup final in 2006, losing 2–1 to Auchinleck Talbot but were triumphant two years later beating Cumnock juniors 2-1 in the 2008 final. The ground has a large standing terrace down one side, which was opened in 2012, with the other three sides are made up of grass banking. Beside the stand is a relatively new building, housing the changing rooms, clubhouse and refreshment bar. 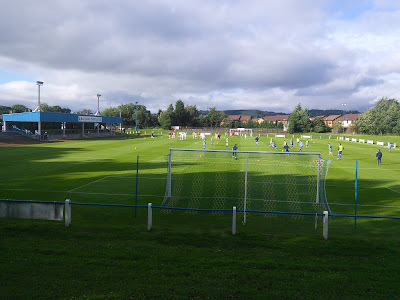 The dugouts are on the far side and a special mention about the pitch, which isn’t just the best in the Scottish Juniors, but probably one of the best in Scotland. Creamery Park also has a rarity at this level – a full set of floodlights. After a poor start the match finally sparked into life just before half time when the ball dropped to Aaron Hay on the edge of the box, to fire in on the half volley. 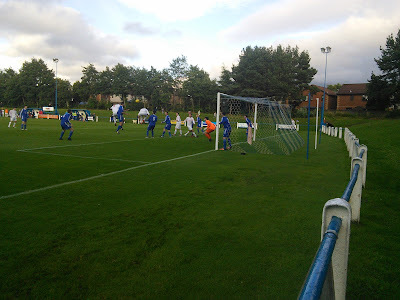 The second period saw a vast improvement with Thistle making a promising start until the visitors took control, with Lee Reid heading in a right wing cross on 53 minutes.. Haws substitute Callum Reid rapped the game up, with a strong run and powerful shot which spun in off the unlucky ‘keeper, before showing good composure to make it 4-0 with twenty minutes remaining. I drove up to Edinburgh, where James Little was good enough to put me up for the night so I could tick off two Junior grounds for my book. I set off at lunchtime and arrived at 3.15pm, quickly dropping off my bag before heading off to Waverley Station. We decided to catch the 1648 train, allowing us time to check out the new Wetherspoons outside the station – The Booking Office, then we alighted headed to the Bathgate branch – The James Young. I decided to have a decent break from football this summer so this was my first match of the season. 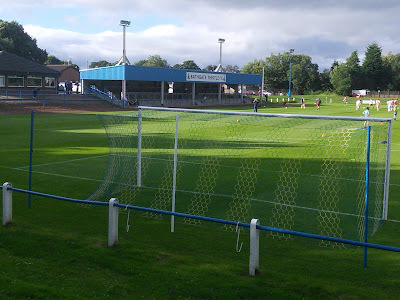 Although the match wasn’t a classic it was good to be back, the evening made more special by the warm reception (including get in for nowt) received by the two Roberts at Bathgate Thistle. A more thorough report about my matchday, the club and the history of the town will appear in my book which is hopefully coming soon.